Ten Kills The Packs poetic focused material is put forth by singer/ songwriter, Sean Sroka; a musician deriving from multiple bands, genres, and touring music projects that have carved through the eastern coasts of Canada. Instigated by the first release song release ‘Barcelona’, reaching 295K+ streams on Spotify, the arrival of debut EP, Force Majeure May 3rd, 2019 is much anticipated. Ten Kills The Packs multiple song releases have lead the project to the featured cover position of significant official Spotify playlist ‘Folk & Friends’, Indie88’s Black Box Sessions, and major placement of the third release ‘When I Say You Are Killing Me’, to official Spotify playlist ‘The Most Beautiful Songs in the World’, giving the song the warmth of it’s 2 million followers and possibly the nicest compliment it could get. For more; Here are some thoughts on Ten Kills The Pack by Sean’s most biased friend, Dave. "... He lives in those moments, those real conversations about adolescent fears, growing up and faltering relationships. 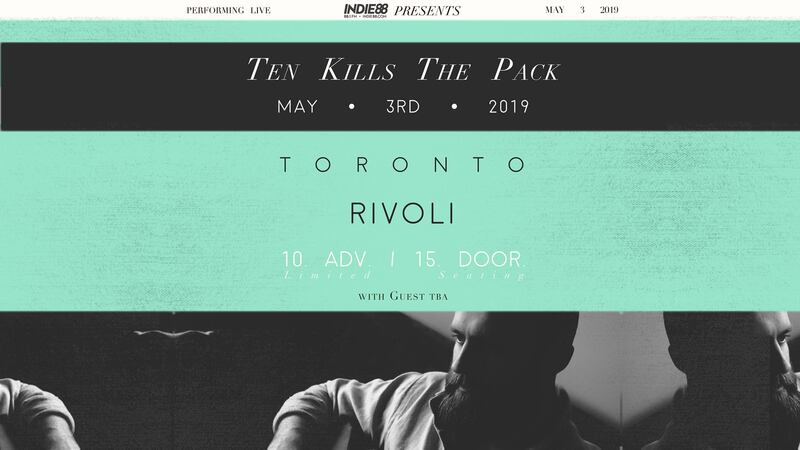 Ten Kills the Pack is for every late night bar dweller, every person unsure about their “path” and for every introspective human being overanalyzing their life choices. It’s what myself and others have always connected with his music so easily. Drawing from his all-time influences such as Stan Rogers, Dylan, The National, or Laura Marling, Sroka is a modern day poet, commenting on what it means to be a complex human in the modern age." Sorry, tickets are no longer available online.